I thoroughly enjoyed, but didn’t love, Poison Princess. I liked Jack, the post apocalyptic feel, and the idea of this epic Tarot Arcana war. I enjoyed getting to know all of the cards but it wasn’t until I read Endless Knight that I loved this series. 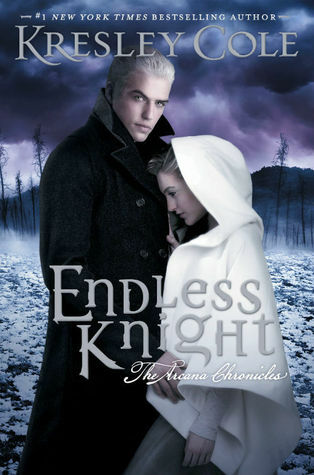 Endless Knight takes the plot established in Poison Princess and everything just gets better! There is more action, more killing, more kissing, and better character development. Evie in Poison Princess felt very sporadic to me. There were flashbacks and Evie was trying to adjust after the Flash. Her character didn’t feel very solid to me. In Endless Knight we get to really know Evie post-flash and I liked seeing her grow and change as the character of Death is introduced. Evie really communed with who she was in a past life while becoming her own person in this life. Jack also grew up in this story. Before he was completely centered on protecting Evie but after what he witnessed at the Alchemists house at the end of Poison Princess Jackson realizes Evie doesn’t really need protecting and he becomes more like a partner to Evie then a protector in his story, although he still has that very alpha male mentality. By far my favorite addition to the story was the Endless Knight, Death. He is at once bad guy and good guy. His character really straddles the gray, morally ambiguous, area and I liked him all the more for it. He is dark, wicked, and I couldn’t help feeling sorry and lonely for the guy. I actually can’t wait to see more of him in the next book and dare I say it, I might be Team Death? Yes, I might be, but Jack could still surprise me. Overall, I loved this story and it was even better then Poison Princess. It was packed with epic battles between zombies, cannibals and other Arcana. There was some serious romantic tension and to top it all off there was the classic Kresley Cole dark comedic undercurrent. I am now eager to get my hands on the third book in this series and I’m expecting more great things. The Black Friday PC Games Ad 2019 is Here! I have all of the Black Friday PC Games Deals to share with you Black Friday PC Games Ad Scans for you to preview so you can see all the deals coming up at Black Friday PC Games Deals.